I'm a HUGE fan of Primeval Thule by Sasquatch Game Studio! Backgrounds here are based on the Narratives in Primeval Thule, so they will gain abilities as a character levels. I've made the decision to treat them as backgrounds because they fill a similar niche as 5E's backgrounds, but allow abilities to be gained as you level to reflect the high action and deep peril of the setting. 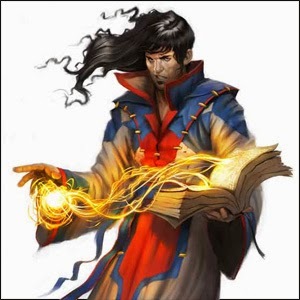 Skill Proficiencies (1st level): You are Proficient in Arcana, History, and Religion. Langauges (1st level): Common and any three. Tools Proficiencies (1st level): Quill and ink and astrolabe. Remembrance (1st level): As an action, spend a Luck point and can consult the Black Book to regain the use of a spell you cast in the previous round. The spell must be at least one level lower than the highest-level spell you can cast. Ritual Insight (6th level): The Black Book can act as a focus and material component for any divination spell. The book is not consumed when used as a material component in this way. Optionally, this is a feat and can only be taken if you have this background and are at least 4th level, also gain +1 Wisdom. Secret Legend (10th level): Once per day, you can cast legend lore for free (no component or focus cost) by simply consulting the book. Optionally, this is a feat and can only be taken if you have this background and are at least 8th level, also gain +1 Intelligence.